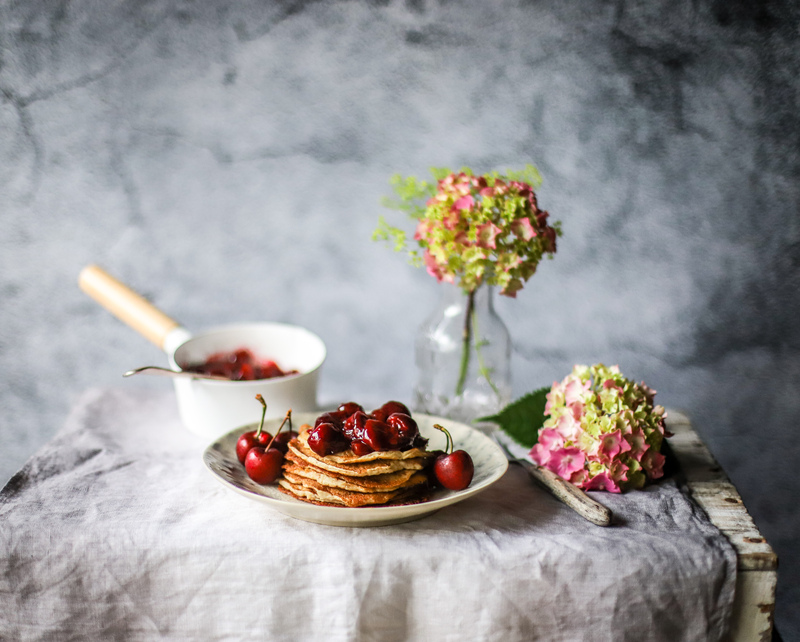 Make nutritious, gut-friendly probiotic pancakes with an easy fresh cherry sauce – that can double as a pie filling! – for a delicious weekend family breakfast or dessert. One of the happiest sights in the past week is the overspilling boxes of fresh British cherries in the local markets and shops. Shiny, edible rubies, it is all I can do not to sample as I shop. But because I am not a child I have instead been silently willing a small avalanche in the produce department. It would just take a small nudge. Maybe even just a sneeze. Following last week’s cherry-centric Thai fruit salad, I am pairing cherries with some truly lush pancakes. Pancakes that happen to be good for you. And it’s as simple as soaking oats. And adding one special ingredient. My recipe can be adapted to the way you normally make pancakes. Even if you use a box mix, all you need are one or two tweaks to offer benefit to your gut. But I am giving you a good recipe to wring the best out of just a few ingredients, so please do give it a go come the weekend. 1. Soak wholegrain oats overnight with a mixture of milk kefir or water kefir. You know which will give the tastiest results, right? 2. Mix some of the overnight oats with more milk (dairy-free is fine; I use hemp), a little flour (sprouted spelt flour is fab), and some leavening to a thinnish batter and pour into a lightly oiled pan. You can use more flour to make thicker pancakes. I prefer thin ones but they do spread a bit unevenly because of the texture of the oats. Do I care? Nope. Oh, and you can keep the rest of the soaked oats for more pancakes, or have as actual overnight oats with either this cherry sauce or whatever you fancy. The oats will happily keep another day in the fridge. 1. Replace 1/3 of the mix or your flour with oat flour, adding 1/4 tsp more bicarbonate of soda. Tumbling whole oats in your blender will give you a good flour – no need to buy oat flour unless you don’t have a food processor or blender. 2. Replace 50-100 ml of your liquid with milk kefir. What are the gut benefits of oats and kefir? Whole oats are a brilliant prebiotic food, meaning they help to feed the good bacteria that live in our gut. These superstar whole grains contain a lot of a special fibre known as beta-glucans, as well as non-digestible resistant starch. As for kefir, this hugely probiotic drink helps populate our gut with a ridiculous amount of health-promoting good bacterias. Usually containing over 40 strains of bacteria, kefir is basically like yogurt on steroids. There is so much more to say about milk kefir. Have a read of this layman’s article (with citations) from Healthline.com. Homemade milk kefir is super easy to make, but organic bought is great too. You can also use coconut milk kefir to make this a vegan option. What do probiotic pancakes taste like? The taste of these probiotic pancakes is really fabulous: slightly nutty, with a slight tang. Andrew was all over them, despite eating them cold (his choice). I guess they are a bit like yeasted blini. But these have their own naturally fermented yeasts instead of from a packet. They certainly have more “depth” than traditional Western pancakes. Come to think of it they are even more like the idli I love so much from my favourite (southern) Indian family restaurant. Very much like idli in fact, but a helluva lot easier and with completely different ingredients. Won’t cooking kill off the probiotics? Yes and no. Yes it will kill off some of the healthy bacteria, but there is strong evidence that for the most part this doesn’t matter. Heat-killed probiotic bacteria can produce similar inflammation-lowering effects as live. While perhaps only the live bacteria can multiply in the gut (makes sense), the so-called inactivated bacteria do exhibit anti-inflammatory properties and responses. For some populations with lowered immune response – such as those on active cancer treatment, are elderly, pregnant or medical condition that lowers immunity, like HIV – this could be a great way to get some of the benefit without any of the risk. The pancakes are neutral as written, but you could add vanilla powder and a wee pinch of sugar or good stevia to make them more overtly sweet. A small mashed banana would be nice instead of added sugar. Other flavours you might like are grated nutmeg, ground cinnamon or cardamom. Instead of the cherry sauce you could spoon on some fermented berries. You could go more left-field with some beetroot, spinach or kale powder to give a colour shock to your plate (I would nix the cherry sauce at this point…). Or how about be more Kellie and add turmeric and black pepper? With this I would throw on some sauteed greens and maybe a fried egg. As for the sauce, go for any fruit you like. My vote is for cherries this week, but when the wild blackberries ripen I will be all over those. No loyalty. How is your gut health? Do you think adding tweaks to your diet and menu help your gut, or do you find supplements to be of more help/easier? 1. Mix together the overnight oats and cover with a clean tea towel or paper towel secured with a rubber band. 2. The next day, measure out 300g of the overnight oats and place in a mixing bowl along with the milk, flour, bicarbonate of soda and lemon juice. Mix well and let sit for 10 minutes. Spoon the remaining overnight oats into a lidded container and use within two days as porridge/oatmeal or more pancakes. 3. Heat a well-seasoned pan with a little oil and, when a flick of batter sizzles, pour in mix to make several small pancakes. After 30 seconds, tilt the pan gently to get the oil around the pancakes. When bubbles populate the surface of the pancakes, gently flip with a spatula and cook until browned on the bottom. Carry on with the remaining batter. 4. To make the cherry sauce, tip the cherries into a pan with the water and bring to a fast simmer, stirring occasionally. When the cherries start to break down add the sugar and continue to cook on a simmer for a few minutes. Mix together the lemon juice and cornflour/tapioca starch and pour into the cherries, stirring thoroughly. The cherries will thicken slightly but will not be gloopy. Take off the heat and use some for the pancakes, and spoon the remainder into a clean jam jar. Use within one week. These are brilliant sweet, sour, savory and really flavoursome pancakes. Top work and a happy gut! Love this – but need to tweak as have gut issues (SIBO) so have to avoid some FODMAPs! 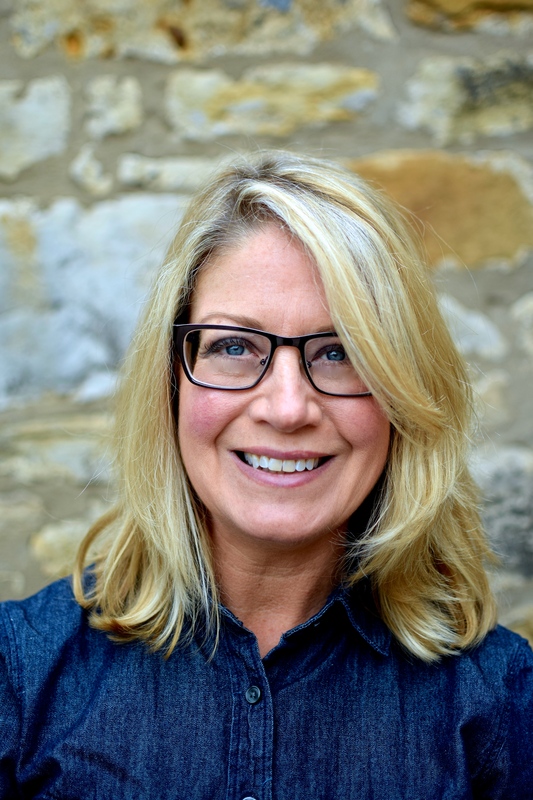 Hi Kellie — I love your blog — I feel a little buzz of anticipation when I see the notice in my inbox. A question: I know that oats are a prebiotic food — but regarding the probiotic benefit (of the kefir), don’t you lose that when you heat/cook the food in question (because heat kills the bacteria)? Or maybe not, because the pancakes are cooked very lightly and quickly…? Love that you have shared healthy pancakes! How fabulous! With in-season cherries, quite irresistible. I absolutely love this idea! Yeah, I was a bit concerned about the probiotics being killed in the heating process, but I read one of your responses to a comment and was really excited to see that the bacteria survives in the oats! Definitely will be sure to cook my pancakes quickly if I use a vegan probiotic yogurt for this batch! I’m in love with these pancakes! And, that cherry sauce. Oh, my. Swoon!!! I can’t wait to experiment w/ a gluten free version when I get home from vacation. Yum!!! What a smart recipe Kellie, can’t wait to try it! Hey do you think these would hold on a buffet? Maybe on a steam table with the sauce in a crock pot? THANKS! Ha ha. Maybe nothing! We are celebrating an achievement at work and I’m feeding my staff for the week with “fill the fridge” so they can have breakfasts, lunches, and snacks at the ready. I’m considering taking in some random homemade things throughout the week so it’s not all sandwiches, cold cereal, and microwave meals. Their favorite is my really-bad-for-you spinach artichoke dip. I thought perhaps I should balance it out with something healthy! Now that I’m thinking about it though, some of that sauce in the freezer to save for our family Christmas breakfast is definitely in order! These look so delicous! I love that the recipe is simple and doesn’t require any strange or expensive ingredients. Keep it up! Gorgeous! And perfect timing as I already have fermented overnight oats and a carton of juicy ruby cherries. Thanks Kellie! I love this idea! I sometimes have overnight oats left over, and usually chuck them in a smoothie or something. Using them in pancakes is brilliant! This is such a delightful pancake recipe. I enjoy oats in my breakfast. These pancakes are lovely twist to my healthy breakfast regime. Thank you for sharing.